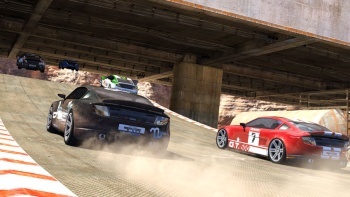 The upcoming Trackmania 2: Canyon won't use Ubisoft's always-on DRM, but it won't be available on Steam, either. Let's play the good news/bad news game. First, the good news: Trackmania 2, the upcoming addition to Nadeo's long-running series of over-the-top racing games, won't require always-on DRM, despite Nadeo's 2009 acquisition by Ubisoft. "You'll need to register online once when you install the game," a Ubi rep told Rock, Paper, Shotgun. "You'll then be able to play without an online connection." But the bad news, although the relative "badness" is entirely a matter of opinion, is that the game won't be appearing on either retail shelves or Steam, at least for the foreseeable future. A Nadeo rep stated on the ManiaPlanet forums that "there is no box version scheduled right now," explaining that the game is intended to be a low-priced product available to anyone, anywhere, for years to come, a long-tail approach to sales that simply doesn't fit with the retail sales model. As for Steam, the rep said in a separate post that while both Trackmania Nations and Trackmania United are on the service, the new game's dependence upon ManiaPlanet makes Steam integration a very tricky proposition. It could happen but if it does, it "very likely" won't be until next year; nonetheless, the rep suggested that Trackmania fans who absolutely, positively must have the game on Steam wait to see how things work out because under Valve's current policies, fans would have to buy the game twice - once from ManiaPlanet and then again from Steam to have it on that platform. "We know people do this, especially when prices are low. We could say it is good for us, but I don't really like it," the rep, who by the way pretty obviously doesn't speak English natively, wrote. "So, if you really want it on Steam, I can suggest to wait of either see a change in their policy, so you can feel secure to buy it outside of it today or to wait to see if we go on it and all I can say to help is that if it happens, it is very likely to be next year." Trackmania 2: Canyon comes out on September 14 for the PC.